Made from layers of cement, Encaustic tiles are often hand painted with patterns hydraulically pressed into the surface resulting in a large range of beautifully artistic patterns with some companies offering a bespoke design service. They are known for their durability making them a popular option for floors. 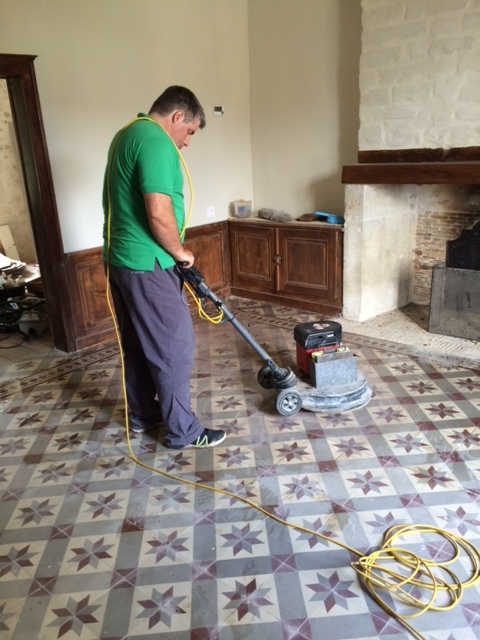 Like Encaustic, Encaustic tiles are generally very easy to clean and generally need little maintenance. Encaustic tiles however being made from cement are micro porous and so should be sealed to avoid dirt becoming trapped in the pores of the tile which will make them difficult to clean. Once sealed make sure you only use a neutral PH cleaning product to clean the tiles as stronger products (especially acidic) will reduce the life of the sealer. If you have the use of a 150 RPM (or slightly higher) buffing machine restore the finish by burnishing the floor using a No.1 Red burishing pad to take off the old sealer and ground in dirt, add water to the area and then go over each tile with the pad 3 or 4 times, then remove the dirty water using a wet vax and rinse the floor. Next take off the coarse pad and apply a No2 Blue burnishing pad and repeat the process followed by the No.3 Yellow burnishing pad. Again remove the water with a wet Vax machine and then scrub the grout joints with Pro-Clean diluted 1:5 parts water. Leave to fully dry and then complete by applying a No. 4 Green burnishing pad and polish with a squirt of water. When fully polished protect the floor by applying a sealer as per instructions below. When the tiles are fully dry apply a coat of Tile Doctor Colour Grow, colour grow is an impregnating sealer that will occupy the pores in the tile and protect it from staining, it will also enhance the stronger colours in the tile. Please note a second coat of sealer may be required if the tile is very porous. For regular cleaning use a sealer friendly cleaning product such as Tile Doctor Neutral Clean which has been especially formulated for the regular cleaning of sealed tiled surfaces keeping them fresh.